The June 1952 issue features this “Spoke Pan Holder” and I knew right way I wanted to make it. I love the Spoke Motif, and it becomes a fairly mindless pattern once it’s set up. The pattern is quite easy, and would also be a nice afghan, or tablecloth, or even scarf, depending on what yarn or thread you use. I did this red one following the original pattern, but didn’t sew on a ring, just because I doubt I’d ever hang it up anyway. Will be super easy to add later if I want to. Use any yarn, with a hook size to match. The red sample is crochet thread, size 5. Any yarn or thread could be used. Round 3- Ch 6 *skip 2 dc, in the third dc work 3 dc in same stitch, chain 3* repeat around. You will end with 2 dc in the same space as the first chain, then join to the 3rd stitch in the chain- You should have 6 open spaces. If you want to make the pan holder, make two pieces the same size. Then: Hold both pieces together and sc around. Then dc in each sc and between shell panels, chain 7, dc back in same dc, continue around, making a chain 7 loop over the center of each shell. Work around around of DC, in each ch 7 loop ch 3, sc, ch 3, then continue to dc. Join and fasten off. If you are struggling, here’s a tip. Each row creates a ladder of shells, which creates the spoked corners. Once it’s set up each round increases the number of stitches between spokes by 2. So first you create a ring, then some spokes, then some spokes with one stitch between them, then that stitch becomes 3 stitches, then 5, then 7, then 9, and so on. Make an afghan, using worsted or even bulky weight! Just sew the motifs together. Make a scarf. 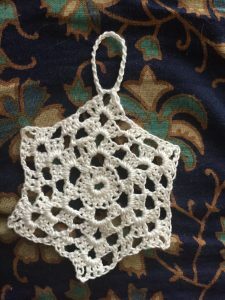 Make lots of small thing motifs and hook them together with several across, OR make larger motifs and simple hook them together on one long side. It really is just an amazingly versatile and easy little shape. If you have any problems with the pattern PLEASE let me know. I’d also love to know what you make with it. Enjoy! Next Post: Reusable Water Bombs- Crochet, washable, and FUN!